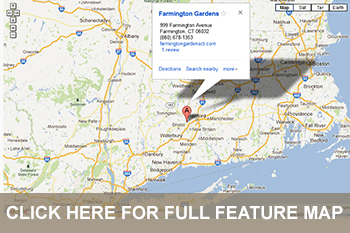 Farmington Gardens is conveniently located on Rt 4 in Farmington, Connecticut. Take exit 39 off Interstate 84, continue onto Rt 4 West. Farmington Gardens will be 2.5 miles on the left. Farmington Gardens is located 3.2 miles from Unionville Center on the right. Farmington Gardens will be 0.7 Miles on the left. We are open for tours daily except during events.